China is conducting naval exercises in the East China Sea, state media report, amid heightened tensions with Japan over islands both claim. The exercises are aimed at "sharpening response to emergencies in missions to safeguard territorial sovereignty", state-run Xinhua news agency said. They involve 11 ships and eight aircraft, including vessels from marine surveillance and fisheries agencies. The agencies' ships had been "harassed" while in disputed waters, it said. 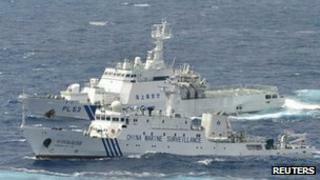 China said the exercises would take place on Friday, but gave no details of the location in the East China Sea. State-run CCTV showed members of the Chinese military, as well as footage of a frigate, fighter jets and helicopters. China, Japan and Taiwan all claim the islands, called Senkaku in Japan and Diaoyu in China. Japan controls the islands, which lie south of Okinawa and north of Taiwan. Japan's recent acquisition of three of the islands from their private Japanese owner sparked both diplomatic and public protests in China. Since then ships from both China and Taiwan have been sailing in and out of waters around the islands, prompting warnings from Japan that an accidental clash could cause the situation to escalate. It is unlikely the 11 Chinese ships will try to enter Japanese-controlled waters, but if they did it would be a major escalation of the dispute - from one involving civilian vessels to ones explicitly involving military ships and aircraft, says the BBC's Rupert Wingfield-Hayes in Tokyo. The US has called for cooler heads to prevail in the dispute, which has rumbled on for years. US Deputy Secretary of State William Burns visited both Tokyo and Beijing this week for talks. But Japanese media reports say Japan and the US are planning a joint military exercise in coming weeks that will include retaking a remote island. Speaking in London, Japan's Foreign Minister Koichiro Gemba said his government's decision to purchase the islands was pragmatic, because a plan by Tokyo's right-wing governor, Shintaro Ishihara, to buy them had been much more provocative. Media captionForeign Minister Koichiro Gemba: "Important to calm down the situation"
"The owner of the islands had already made it clear that he has decided to sell the islands to someone," he said. "Under such circumstance, the Tokyo metropolitan government could have bought them. The situation could have been much worse, if the government didn't buy the islands, I believe that Mr Ishihara would have landed on the islands by now." While Mr Gemba emphasised Japan's sovereignty over the islands, he said it was crucial for both countries to prevent further escalation of the situation. "For Japan, China is the largest trading partner. Japan also has the largest number of businesses investing in China. On the issue of sovereignty, Japan cannot concede where it cannot concede. But our economies are interdependent and we want to cherish the mutually beneficial relationship," he said. "To achieve the goal, Japan and China should maintain and reinforce communications. We also have to respond to the situation in a controlled, restrained and calm manner." The row has had some economic impact - both sides say their tourists are shunning each other's countries, and Japanese firms in some Chinese cities suspended production while protests took place. On Friday Chinese carrier Spring Airlines cancelled a promotion offering free tickets from Shanghai to Saga prefecture in Japan following outcry from netizens. "We cancelled the offer last night after taking into consideration the feeling of netizens," spokesman Zang Wuan told Reuters news agency. The airline also cancelled another offer between Shanghai and Kagawa prefecture that it had launched days ago.